The day Pyre opened at 3320 18th Street (an elusive and ambitious exhibition space known only by its address, without a website or social media presence), San Francisco’s air-quality index peaked at 158. “It’s much better today,” we said to each other. 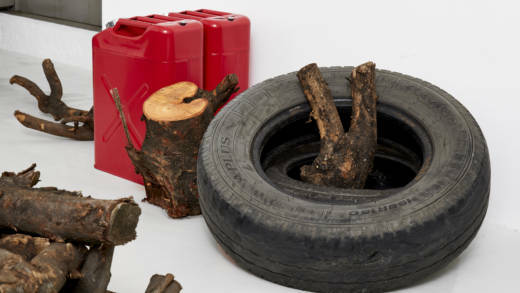 Inside the building, through a door labeled “Cushion Works” and up a flight of stairs, people removed their N95 masks to encounter a room filled with 71 liters of gasoline, 23 used car tires and 760 kilograms of wood—the exact amount of matter forensic experts calculate is needed to fully incinerate one human body. 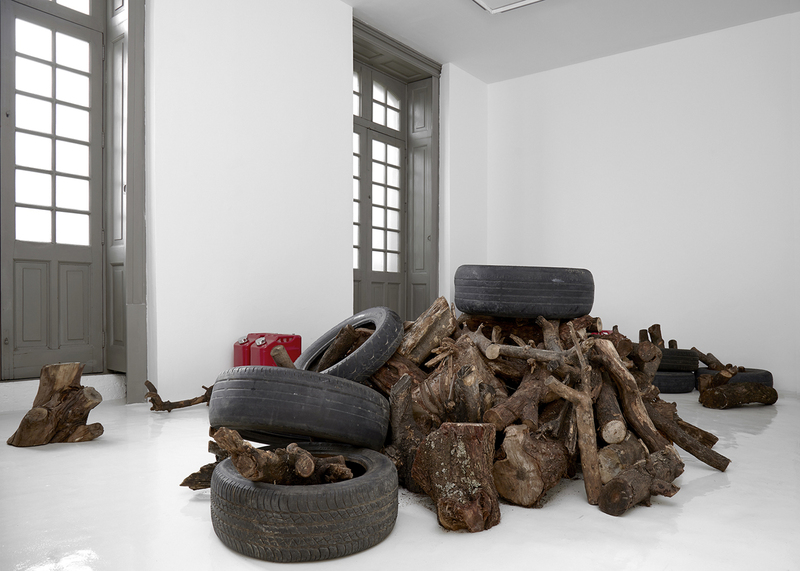 And in that moment, Mexico City-based artist Joaquín Segura’s installation, already powerful, became locally haunting. 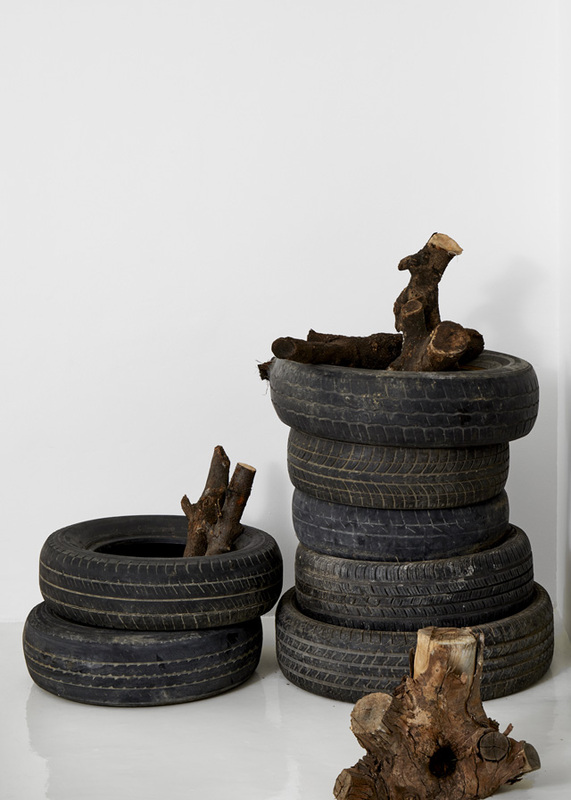 Pyre has been staged before; in each incarnation the artist sources rough chunks of wood, tires and metal cans of gasoline from the hosting city, arranging stacks and piles to fit each gallery. In San Francisco, 3320 18th Street’s L-shaped space allows for a heart-thudding reveal. Small groupings of material lead to an enormous, overwhelming mound around the corner, forcing the opening-night crowd of gallerygoers to situate themselves in the artwork’s rare negative space. Segura's installation deals in scale and precision. In the immediate, it addresses the 43 students from the Ayotzinapa Rural Teachers' College who disappeared in Iguala on Sept. 26, 2014, and the Mexican government’s official account that they were kidnapped by police and turned over to a local drug gang. The gang, the government maintains, then killed the students and burned their bodies on a pyre in a nearby garbage dump. A six-month investigation by the Inter-American Commission on Human Rights found that explanation “scientifically impossible.” And in Segura’s installation, the physical truth of that commission’s finding becomes clear. The amount of material needed to burn one body is immense. To burn 43 without a trace? Unimaginable. But that truth—that the official narrative is false—is one of the only truths available in the story of the 43 students. What really happened that night, already unknown for four long years, may never be known. Segura links the disappearances to events from his country's history that stretch back 50 years (the students were on their way to Mexico City to commemorate the anniversary of the 1968 Tlatelolco Massacre) and continue daily. Mexico’s “War on Drugs,” backed monetarily by the U.S. government, officially began in 2006. And since 2006, violence in Mexico has claimed more than 250,000 lives, a murder rate five times than the United States'. Along with the dead, the government categorizes some 37,400 people as “missing,” but many believe this number is low; families are reticent to file reports with local authorities who might be involved in their loved ones’ disappearances. The toll, Segura noted the night of his opening, falls mostly on the powerless, the ordinary Mexican citizens who are neither government employees nor drug traffickers. In its potential for violence, Pyre creates a creeping terror in the viewer, compounded here and now in California by the addition of a fourth material element—air filled with the ashes of lives, homes and acres consumed by the Camp Fire. These two fires—the fires that would destroy evidence of wrongdoing and the fires that still rage in Butte County—are separated by circumstance, source and purpose. One is intentional, the other accidental. But both speak to the complicity and impunity of those in power. And both find their victims in the ordinary citizens subject to that abuse of power. Segura said reports of mass graves, the growing number of disappeared and everyday violence have become normalized in Mexico. Here, we grow used to the “new abnormal” of a thing we've named "fire season." We acclimate to extreme drought and devastating firestorms. To enormous loss. To the hopelessness of never knowing the truth. 'Pyre,' curated by Jordan Stein and Ivan Muñiz Reed, is on view by appointment at 3320 18th Street in San Francisco through Jan. 12, 2019. Details here.